A Front door isn’t just central to the appearance of your home, it’s also what separates you and your family from the wind, the rain and the world outside. That’s why the Apeer range isn’t just a stunning range of elegant doors, but are manufactured to be the most secure, durable and energy efficient external doors available in the market today. With the sophisticated appearance of a solid timber door and all the stability, energy efficiency and durability of modern materials, an Apeer door is the perfect hassle-free protector for you home and family. The Apper 70 and 44 is made from GRP fibreglass, combined with PVCu with steel reinforcement and a rigid, high density energy retaining, injected polyurethane core. The Apeer comes in a wide range of colours, including 24 standard colours but for a bespoke colour, something unique to you, simply bring along a RAL or BS colour reference and the door will be colour matched. 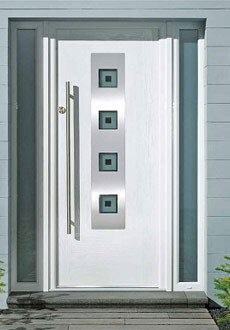 All doors can be coloured both sides or coloured outside and white inside. Elegant, No maintenance and Secure.